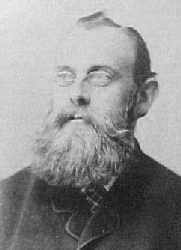 MAXIMILIAN BORHO.... Max Borho, who founded the Regensburg factory, was born in Neuburg an der Donau (Danube) on May 22, 1840. He was a modelleur (designer) by profession. Max married one Catharina Geier of Duesseldorf. Soon after, they moved to Cologne, and then to Höhr. Two of his children, Helena (7/27/1869) and Willhelm Otto (10/7/1870) were born in Höhr. 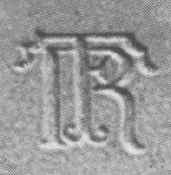 There is evidence that Max worked for Reinhold Hanke, and that is probably where he learned the manufacture and use of plaster molds. Max may also have worked for Merkelbach & Wick. In 1874 we find Max in Regensburg attempting to start up a steinzeug factory. He represented himself as a “Fabricant” (Manufacturer), “Mitbegrunder” (Co-founder) and “Modelleur” (Designer). While we have proof, from his children's baptismal records that he was a modelleur, there is no evidence that he was ever a co-founder, or a manufacturer, until he founded the Regensburg factory. Whatever his claims, he must have had a letter of introduction, and guarantees, from someone in the Westerwald. In an area totally devoid of the proper clay, Max was successful in convincing two men to become his partners in the steinzeug factory. There are surviving records, from 1882, showing that 120,000 lbs. (60 tons) of Westerwald clay was shipped to Freising, a second factory founded by Max Borho. 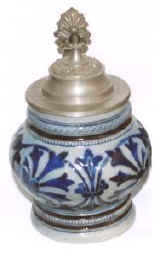 Similar amounts had to have been shipped to Regensburg, and this would have been on going each year from 1874 to 1886. 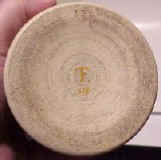 I believe it was this clay, that Max Borho used to attract his partners. His partners were August Zinkl and Rudolf Thaller who was Zinkl’s brother-in-law. 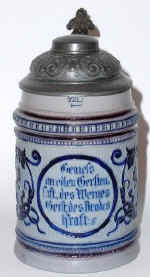 The company was called “Borho, Zinkl and Co.” In 1875, after only 13 months, Max sold his share in the factory to Gustav Freidrich “Fritz” Thenn, and moved on to Freising. 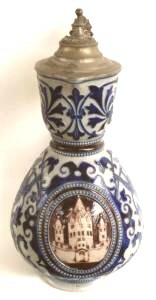 On January 1, 1876 Max founded a second steinzeug factory in Freising, with a new partner, Adam Schoen, again in an area devoid of the proper clay. The company was called “Schoen and Borho.” In 1882, this second company became Hauber & Reuther. Rudolf Thaller (silent partner, & Zinkl’s brother-in-law). 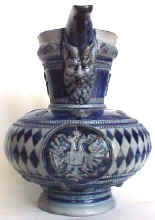 Produced Borho designed “Old German” (Historismus) style products, similar to Hanke. 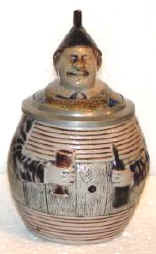 Max Borho sold his share in the factory to Gustav Frederich “Fritz” Thenn. 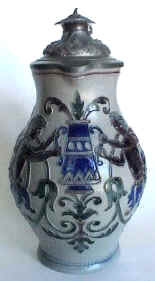 The factory continued to produce Borho designed Historismus style wares, but also something half way between Historismus and contemporary. They also produced blanks for the August Saeltzer workshop in Eisenach. Fritz Thenn bought out his partners. 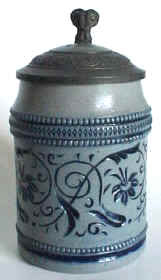 After the 1876 Arts and Crafts Exhibition in Munich, and the resulting criticism in 1877 that compared the products of this factory unfavorably to those of Merkelbach & Wick, Fritz Thenn became the sole owner. 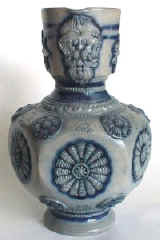 The factory began to produce “contemporary,” Westerwald style, blue, manganese and grey steinzeug. They continued to produce blanks for the August Saeltzer workshop in Eisenach. 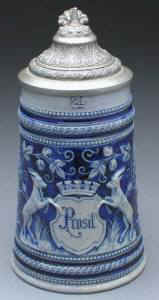 Fritz Thenn placed an ad in the "Ceramic Address Book" for 1887, but closed the doors to the factory in 1886. 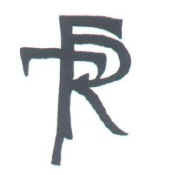 What happened in 1886 that caused him to close the factory, when he had planned on being in business the following year? It appears that sometime in 1886, both the Regensburg and Freising factories lost their supply of Westerwald clay. 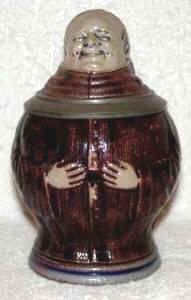 Reinhold Hanke died on June 22, 1886 and I believe Hanke was the source/guarantor of the clay. When he died, his guarantees died with him. There were also economic and political factors at work during the mid to late 1880s that played a part in what happened at the Regensburg factory. Wages were on the rise, countries to which they exported their wares began to charge import duties, there were too many steinzeug factories in operation and the supply was outstripping the demand. Records from the Regensburg factory show that business had declined and workers were in danger of being let go. The factories in the Westerwald were probably facing the same issues. Some factories had to go and the Bavarian factories were more than likely that something. 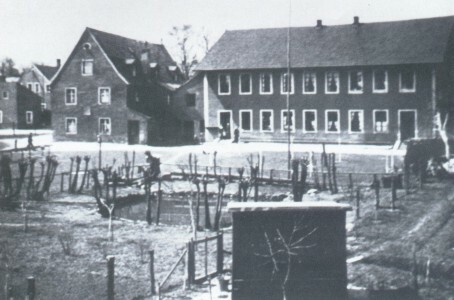 Reinhold Hanke's death provided a convenient out and the clay supplies to Regensburg and Freising were cut off causing Fritz Thenn to close his factory for good. 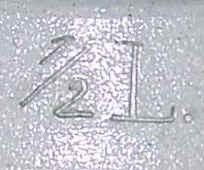 MARKS....These capacity marks were used by the Regensburg factory. Fractions were used for 1/4 and 1/2 liter measures and decimals such as 0,4 liter were used for all other measures. 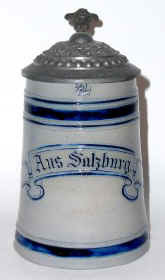 Capacity marks were rarely used and when applied were always on the front of the stein, except for those blanks made for August Saeltzer which were placed on the rear of the stein, probably at the request of Saeltzer. 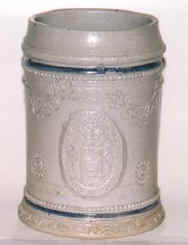 The capacity mark on the "Regensburg" style steins, if used, might appear anywhere around the rim. 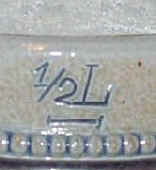 The 1/2 liter mark in the center is from a "Regensburg" type stein produced at the Regensburg factory. FACTORY LOGOS.... These marks, like the capacity marks, were used sparingly. 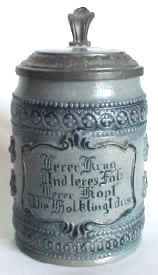 I have never actually seen a stein with the first two "FTR" marks. 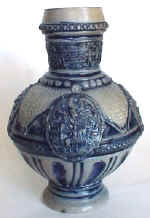 The one on the left was incised on the bottom and the one in the center was incised under the handle and covered with thick blue saltglaze. 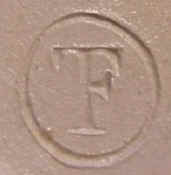 The "FT" mark on the right is found on the bottom of an August Saeltzer decorated piece. PHOTO CATALOG.... 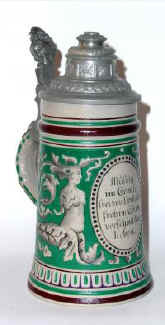 This photo review is only to show the various styles produced by the Regensburg factory between 1874 and 1886. 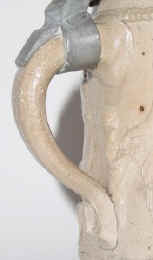 It is in no way intended to be complete, and is shown in model number sequence, rather than production sequence. Following some model numbers in this list you will find a letter. 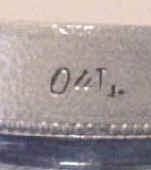 This letter was used by the factory as a capacity designator, "C"=1/2L., etc. 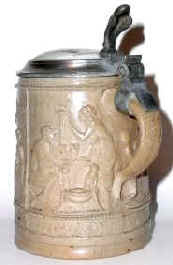 CHARACTER STEINS....Regensburger Steinzeug lists only one character stein produced by the Fritz Thenn factory, a 1/4 liter monk, model number 194. All of the following pieces are now considered to be products of the Thenn factory. THE UNUSUAL.... 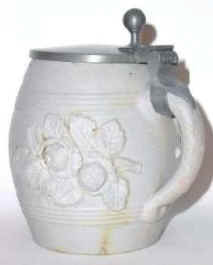 The lamp just below, shows that you never know where the stein of your dreams will pop up. 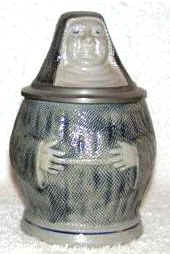 The other two pieces were probably appropriated, or made, for an employee's personal use. AUGUST SAELTZER WORKSHOP.... The August Saeltzer Workshop was located in Eisenach. 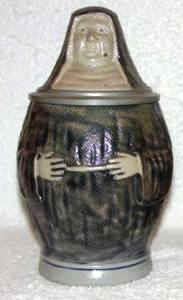 Among other things, they decorated stoneware blanks purchased from various factories. One of those factories was the Regensburg factory of Zinkl-Thenn, and later, The Fritz Thenn Co. 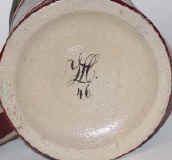 Some of the pieces were decorated by Saeltzer, with his own designs, like the piece in the center, signed by one of his artists and sold from his workshop. 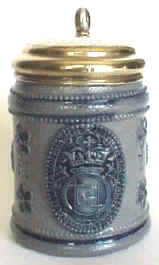 Some of the blanks were decorated with designs supplied by the Regenburg factory. 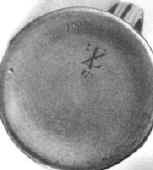 Those pieces decorated with the supplied designs were marked either with a joined ZT, for Zinkl-Thenn, as on the left, or later with a joined FT, for Fritz Thenn like the stein on the right. 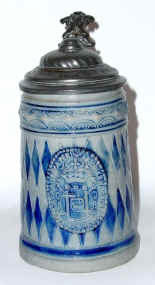 They were then returned to the Regensburg factory, where they were sold through their own outlets. 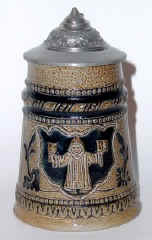 "REGENSBURG" STEINS.... At least sixteen different factories produced so-called "Regensburg" steins, so it is no surprise that the Regensburg factory was one of them. The fifteen other factories were all located in the Westerwald. 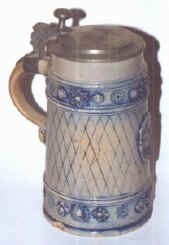 This type of stein (Gepreste Kannchen) was produced from ca.1840 to ca.1905. 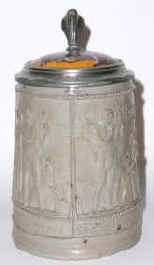 Reinhold Merkelbach was the last factory to produce them. 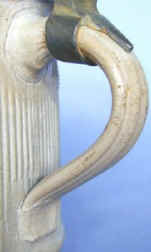 You can recognize Regensburg "Regensburg" steins by their capacity mark and the way the handle is attached. 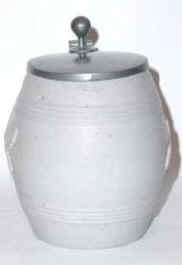 Note the lower handle attachment on the three steins below. Endres, Irmgard and Werner, Regensburger Steinzeug - Kruege und Kannen-, Morsak Verlag, Grafenau, 1991. McGregor, John, HR Steins and the Freising Factory Revisited, Second Edition, Self Published, 2002. Copyright © 2002 by John McGregor. All rights reserved.